If you want to build quality readers list than interaction with them is must. To fulfill their desires and to help them first you need to know what they need actually. The very first thing a webmaster must know is where the visitors are facing problems. One solution to such issue is Forums. It's a way through which people can interact between themselves and even a blog owner can find out the big issues faced by many people. Forum is a platform where visitors can start new threads or topic based on their query. This would generate comments and thus results in a discussion with solution to your question. Anyone registered with forum can make a question that can be resolved or answered by others. If you can't afford a new domain and hosting then here's a free alternative. Simply follow the steps given below to create free forum in blogspot. In this method we're going to use an online third-party website. Go through step by step tutorial given below. Go to Nabble Free Forum. Click Create Free Forum on the home page. Fill the required details such as user name, email address, password, forum name and description (Remember that this account will be the moderator of the forum). Click on Create Account and check you mail to activate nabble account (keep in mind that you must activate your account in order to have access to all features). Navigate to Options>>Application>>Change Appearance. Here you can edit several things such as font, color, preferences and CSS. Add your own CSS to provide it look. Now go to Application>>Change Application Type. There you can categorize your forum to make it appear real. Choose category according to your need and click on Save Changes. 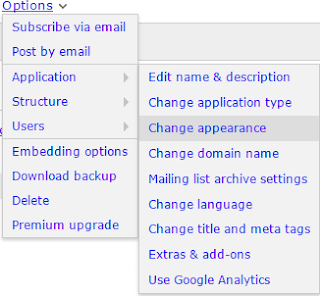 You can modify several other things from application menu such as name, description, language, domain name, title, mega tag, add-ons and Google analytics. 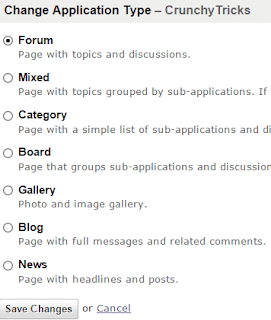 To add categories in your blog go to Options>>Structure>> Create New Sub-Forum. Provide it name and description then click on Create Sub-Forum. Rest of the things you can easily edit which are manage pinned topics, manage sub-forums and Users (Change permission, manage users & groups, manage subscribers, manage banned users). It's not over yet, after that we need to put newly created forum code in our blogger blog. Login into your blogger dashboard then select Pages and create a new blank page. Name it as Forum. Paste the code you saved earlier in the box and publish the page. That's it, simply open this web page and you will see nabble forum. If the above method doesn't work for you then give it a try. Copy the Script from embedding option and save it in Notepad. Now navigate to Design >> Edit HTML and search for following piece of code. Replace red color text with your forum URL and blue with code you saved in notepad. Add following code just above </head> tag in your template. If you don't find code mentioned in orange color then search for this code. Add following code just above the previous step code. Replace red, blue color code. Now paste this code just above </head> tag. 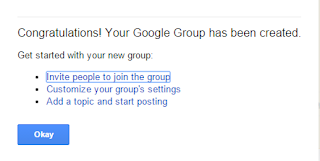 Navigate to Google Groups and fill required details then click on Create. Click on Invite people to join group to build some strength. Then go to Customize your group's setting. On the next page you will see an option to embedding your group. Just copy the code next to it and save it temporary anywhere. Go to blogger and create a new blank page. Paste the code in the HTML section and publish page. Open this page and there you can see your forum. If you've any doubt regarding this tutorial then leave a comment. We would be happy to help you. Great information Rahul. Keep in up. Do you have any idea about how to fix the +1 count problem on blogger blog. A large number of users are facing this problem. I would appreciate your input. Can you elaborate it a little bit more? What's the main issue you're facing? I even just know tha a blogspot site can feature forum. Thank you for sharing the idea. Keep it up.